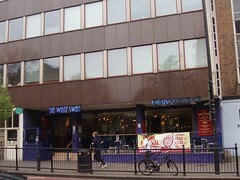 A large Wetherspoon's pub in a converted office building, just by Highbury And Islington Station. From outside, this is an unpromising space, but like most Wetherspoon's conversions, it stretches out to occupy a large floor area, with the bar along the wall on the right-hand side after entering. Some tables are set up by the front windows, and there's a small smoking terrace out the front by the street. An upper mezzanine seating level stretches around and overlooks the main floor. Signage suggests that the upstairs is not for children, and indeed is often quieter with more space available. The beer range is decent, and good value as one might expect from the chain. There are two sets of 4-5 handpulls each along the bar, with a split (more or less) between one set dispensing regulars (Ruddles, Abbot Ale, Greene King IPA, et al. ), and one with more adventurous choices. On Ewan's September 2011 visit, a Saltaire Cascadian Black IPA was very enjoyable and well-kept; the other four independent ales were all bitters and golden ales of various kinds. The food menu is standard, and stretches to steaks, burgers and the like, as well as plenty of vegetarian options, and various deals available. Ewan's 'gourmet' vegetarian burger was reasonable, a large portobello mushroom in a floury bap with a few onion rings and chips alongside, the latter rather disappointing, but the burger and onion rings fine. However, the food quality is largely in keeping with the rest of the chain. Accessibility: The entrance is up a few steps from the street, but there's a disabled lift for those steps, and an accessible toilet on the main floor level. Last visited by Ewan, Kat and others, February 2014. Opening hours taken from website, February 2014. Last edited 2014-02-12 14:57:41 (version 5; diff). List all versions. Page last edited 2014-02-12 14:57:41 (version 5).